No longer reserved for only elite athletes, triathlons have become a mainstream test of endurance for all. Whether you’re a weekend warrior out for a new challenge, or you’re just starting a fitness journey and want a race to work towards, sprint triathlon training is for you. Many people solely envision triathlon as grueling Ironman races – cyclists struggling through 112-mile bike rides while the sun beats down on them; delirious athletes crawling across the finish line. In reality, there are many different triathlon distances. Sprint triathlons fall on the shorter end of the spectrum. Most sprint events start with a 0.25 to 0.5-mile swim, followed by a 10 to 15-mile bike, and then a 5K (3.1 miles) run. This is an attainable challenge that anyone can complete – with a little motivation and commitment, of course. Excellent cross-training – When you train exclusively in one sport, you tend to develop imbalances in strength. With triathlon you naturally incorporate cross training as you prepare for all three disciplines, resulting in more well-rounded, full-body strength. Weight management – If losing weight is a goal for you, triathlon training will help you meet the recommended weekly exercise goals for weight loss. Swimming, biking, and running all scorch calories to help you drop pounds. Longevity and heart health – Engaging in moderate-intensity exercise on a regular basis improves heart health and increase lifespan. Personal challenge – Imagine the immense pride you’ll feel crossing that finish line - plus bragging rights! With all these benefits, it’s no surprise that triathlon growth has exploded in recent years. Industry research suggests a 50 to 60 percent increase in participant growth in the last 10 years. Aerobic fitness improvements come with repeated, consistent training. Swim, bike, and run most days of the week, for at least 8-12 weeks, and you’ll most likely cross the finish line of your race successfully. A structured training program will certainly maximize your preparation and speed, but consistency is above all the most important component. Recovery is two-fold in a training plan. First, on a weekly basis, build in at least one rest day. Second, on a big-picture level, scale back training with a lighter volume week every 3-6 weeks. Your body becomes stronger and more adaptable this way. This periodized method also reduces injury risk. Why is it that some people can train successfully, yet underperform on race day? For a large majority, it’s due to poor mental fitness. The saying “you are what you think most of the time” applies here. If you are struggling with intrinsic motivation and arriving at your first race feeling like you’re going to fail, you just may do so. To conquer this, prep your mental game just like your physical game. Find ways to maximize motivation, set realistic and positive expectations, and control the aspects of training and racing that you are able to (like consistency and recovery). Let’s take a deeper dive into each discipline of triathlon, and how you can prepare yourself for all three sports. Find out the length of the swim in your race, and train so that you’re comfortable swimming a little longer than that. Not only will it help to improve your overall fitness and ease pre-race nerves, but it also serves a bigger purpose. If you’re doing an open water race and there’s a strong current, you’ll probably end up swimming further since the current causes you to drift. Fingertip Drag – When you bring your arm back forward after a stroke, drag your fingertips along the surface of the water. This reinforces proper arm position (keeping your elbow bent) and teaches you how to control arm movement. Clenched Fists – Swim your normal freestyle stroke with clenched fists. This emphasizes the role of the forearm during the “pull” part of the stroke under the water. Catch Up Drill – Use a normal swim stroke, but pause each arm fully extended in front of the body until the other arm catches up. One Arm Drill – Keep one arm extended in front of you, and swim using only the other arm (and your normal kick). Arms-Only – Swim the length of the pool only using your arms, not doing any kicking. Kickboard – Use a kickboard to focus only on your kick while keeping your arms stationary on the board. Mass Start – Everyone starts at once. Wave Start – Athletes are broken into groups, generally based on either age group and/or gender, and each group (wave) starts at a separate time. Time Trial Start – Athletes will start two at a time, generally separated from the next pair by about 5-10 seconds. Most races use a wave start. Nervous about starting in a group of people? Seed yourself in the back of the group, on the side furthest from the first buoy. Yes, you’ll swim a smidge further, but you also reduce the risk of an accidental elbow or kick from being stuck in the middle of the pack. One of the biggest mistakes that a first-time triathlete might make? Training for an open water swim exclusively with pool workouts. Sometimes people get to race day, start swimming in water where they can’t see anything and freak out. It’s easy to quell that fear. Simply get some practice in the open water during training. Not all your swims need to be in open water but make sure at least a couple are. If you get to race day and you do start to panic in the open water, take a few minutes to float, sidestroke, or doggie paddle. Catch your breath and relax. Remind yourself that you will be fine. Most of the time, that small break should be enough to help you continue racing. Of course, if you feel like you’re experiencing a true emergency during the swim, wave down a safety kayak. They’ll come to help you and get you back to dry land. It’s far better to DNF (triathlon lingo for “did not finish”) and stay safe than to risk continuing if you're truly worried. The bike leg can be relatively comfortable or quite challenging, depending on your fitness level and the course. If the course is hilly, you can obviously expect a tougher ride than pancake-flat terrain. For most athletes, though, the cycling portion will feel like the easiest part of the race. One strategy to practice during training? Shifting gears. Gone are those childhood days of using every ounce of effort to climb a small hill on a single speed bike. These days, no matter what type of bike you have – mountain, hybrid, road, or tri—you’ll almost certainly have the ability to shift gears. Unless you'll be riding a seriously flat course, practice cycling on some rolling terrain where you can get the hang of shifting gears. When climbing a hill, shift into an easier gear so that you can make it up the hill comfortably. If you keep the bike in a tough gear riding uphill, you’ll experience more resistance. Your legs have to work harder, which will wear them down before you get to the run portion of the race. Running may be what comes most naturally, but as the last leg in a triathlon—it often feels like the hardest part. Your body is already tired at this point, but if you trained correctly you’ll be able to cross the finish line successfully. To prepare yourself for this part of the race, incorporate “bricks” into your training schedule. Bricks are a back-to-back bike/run workout. The point is not to practice the exact distances, but rather to get your legs used to the transition from one exercise to another. The first time you do this, you might experience a “jelly legs” sensation and find a hard time getting into your run stride. That’s completely normal! Your body will get used to this the more you practice it, making it easier to segue from the bike to the run. Transition is what you do between the swim and bike, as well as the bike and run. You’re switching from one sport to another. Before the race begins, you’ll set up all your gear in the transition area, a large space with bike racks at the race. Be sure your helmet is strapped on before exiting transition for the bike portion, as this is a rule in triathlon. Run with your bike out of transition until you get to the area marked for mounting your bike. Then get on your bike and ride. At this point, you’re ready to start the run. Usually, there’s an area in transition marked “run out” that you will proceed through. Look at the athlete packet ahead of time so you know where the bike out, bike in, and run out spots are in transition. When you set up your transition space, organize all your gear next to your racked bike in a small space—about the width of a folded towel. Don’t spread your gear all over the place, as it’s rude to take up another athlete’s space. Keep a small towel in transition that you can use to wipe your feet off. When you exit the swim, you’ll likely be running on either sand or dirt to get to the transition area. If you plan to wear a wetsuit, practice stripping it off during training to see what strategy works for you. Some athletes strip it off as soon as they exit the swim, some remove it fully in transition, and others work on getting it halfway down while running to transition—then take it off completely once there. Use the method that works best for you. Triathlon can be an expensive sport, but it doesn’t have to be. There are only a few pieces of gear that are absolutely essential for a race. A triathlon suit is made specifically for the sport and includes a little padding to make cycling more comfortable. You can wear a triathlon suit for the entire race. They are very convenient but can be a bit pricey for your first race. There’s nothing wrong with wearing a bathing suit if you’d prefer not shelling out money for gear just yet. Women can wear a swimsuit with a sports bra underneath for comfort, and throw on a pair of shorts in transition before the bike/run. Men can wear spandex style bathing suit shorts and can add shorts over the suit along with a shirt in T1. Note that some races rules prohibit exposed torsos during the bike and run. Read over the race rules to understand what additional gear you’ll need in transition if you’re wearing a bathing suit. And what about a wetsuit? 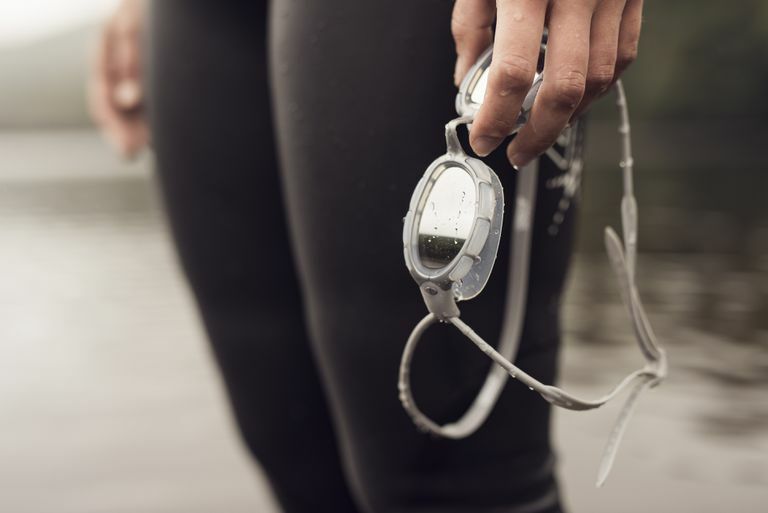 Wetsuits create buoyancy, which can be welcome for those less comfortable with the swim. They also keep you warm; a major benefit in chilly early-season races. For these reasons, a wetsuit can be a nice piece of gear to have for your first sprint triathlon. It’s definitely not a necessity, though. You can certainly do a race without one. If you do wear a wetsuit, it goes on over your bathing suit or triathlon suit. Elite athletes may be pedaling away on expensive bikes, but you can complete a triathlon on any type of bike. You’ll be faster and expend less effort on a road bike that’s meant for cycling quickly on the streets. But if all you have is a hybrid or a mountain bike, you can definitely still finish successfully on them—just slightly more challenging. If you’ve been cycling for a while, you probably have a pair of cycling shoes that you use to clip into your bike pedals. If that’s the case, you’d use those shoes for the bike portion and switch to sneakers for the run. If you don’t have clip-in shoes, you can do the bike and run in the same pair of sneakers. Now that you’re fully versed on all the basics, it’s time to start training. This 13-week sprint triathlon training plan is ideal for beginners. Before you start this plan, you should have a general level of fitness that allows you to swim a few lengths in the pool, bike for 20 minutes straight, and run for 15 minutes straight. If you cannot do those things yet, work on building a base first to get you there. Then start this training plan. For the swim workouts, WU = warm up and CD = cool down. Swim drills are optional but very helpful. If you do not want to do drills, just do the distance listed at your normal pace. If you'd like to do drills, choose a couple to work on each swim workout. The swim distances assume yards (i.e. 4x25 = 4 lengths of 25 yards each) since most U.S pools are based on that. However, you can use it interchangeably with meters if you find a 25-meter pool. If a bike workout lists intervals - like 5x1 or 2x5 - this means the number of intervals and the length of time. For example, 5x1 = 5 intervals of 1 minute each; 2x5 = 2 intervals of 5 minutes each. You should build these into the total length of the workout, ensuring you warm up adequately. Ride the interval at the best effort you can sustain for the time listed. Give yourself time to recover with easy pedaling between intervals. Fartlek runs incorporate fun, random sprints—like challenging yourself to sprint to every other mailbox, or until the next song on your playlist comes on. If a workout does not list a pace and simply lists a time —like 35 min bike or 20 min run - these should be done at a comfortable, conversational pace. USA Triathlon. USA Triathlon Annual Membership Report — 2015 Update. 2015. Kropelnicki, J. Swim Drills for Triathletes. Morell, N. 4 Swimming Drills to Perfect Your Stroke.